The Winston Golf Club is giving away 1 out of every 10 new Shareholder Memberships purchased, starting March 7th, 2018. Our tiered pricing promotion continues, with memberships available at special rates in blocks of 20 at four remaining pricing levels. We currently have 10 Shareholder Memberships available at $11,000, and once those are claimed, the price increases to $12,000*. Shareholder membership must be paid-in-full to qualify for draw. Draws will be made as every 10th new shareholder membership sale has been confirmed until all available shares are sold. Maximum number of free memberships not to exceed 9. The admission to membership and shareholder status at the Winston Golf Club Ltd is subject to the terms and conditions contained in the Membership and Subscription Agreement, the Articles of Association and at the discretion Board of Directors of the Winston Golf Club Ltd.
For more information please download our Shareholder Membership application form. Unlimited rounds of golf from late April through to mid-October. 5-day advance tee-time booking and first priority on weekend balloting. Unlimited use of the driving range, putting greens and practice areas. Club cleaning and club storage. In-house leagues and tournaments, member/guest tournaments and inter-club matches. Membership in Golf Canada and the Alberta Golf Association. Year-round use of the fitness centre and locker rooms. 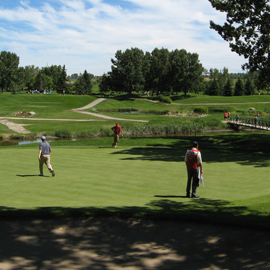 Inter-club privileges at most Calgary-area golf courses and at the Bow Valley Club in downtown Calgary. The Bow Valley Club offers special rates on some BVC fitness-area services. An annual ‘A’ golf membership is an ideal introduction to The Winston; it includes all the benefits of full membership with the exception of voting rights on club matters. This is a one-time, non-transferable membership which expires on December 31. The cost for the 2019 annual membership is $3,875 (plus GST). View or download the application here. Unlimited rounds of golf from late April through October. 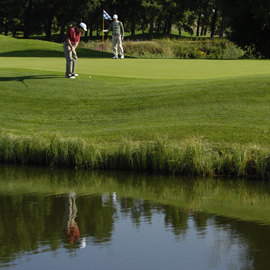 Participation in member-only leagues and tournaments, member/guest tournaments, and inter-club matches. Membership in Golf Canada and Alberta Golf. Use of the fitness centre and locker rooms. A spouse of an Annual A member is eligible to apply for a spousal ‘B’ membership. View or download The Winston’s Membership information package for more information. ‘B’ membership is available to the spouse of a Transferable ‘A’ or Annual ‘A’ member. It is an annual membership category limited to 150 players and therefore may be subject to a wait list. 2019 membership is $2,250 (plus GST). The application form for ‘B’ membership can be downloaded here. Unlimited rounds of golf from late April to mid-October. 6-day advance tee-time booking and second priority on weekend balloting (tee times no earlier than 10:00 am on weekends and holidays). Participation in member tournaments and leagues, couples golf and social events, and interclub league play. The Winston Golf Club has introduced the Young Professional membership for the 2019 season, providing young adults between 30 and 35 years of age the ability to experience the benefits of a private club. Individuals interested in joining The Winston as a Young Professional do not have to be descendants of The Winston members. This membership category is limited to the first 50, so applications may be subject to a wait list. The cost of the 2019 Young Professional membership shall be $2,480 +GST which includes $500 that will be retained by the club in your name and accrued annually to be applied to the purchase of a transferable share at a future date. The member will forfeit the accrued fees in the event they leave the club before share purchase. Payment (in full) must accompany application. The intermediate application form may be downloaded here. Unlimited rounds of golf from course opening to mid-October. 5-day advance tee-time booking and weekend balloting after A and B categories – no tee times earlier than 12:00 pm on weekends/holidays. However, Intermediate members may “walk on'” weekends and holidays ten (10) minutes prior to an available tee time. Unlimited use of the driving range, putting greens, and practice areas. Participation in Club Championships and other member tournaments. 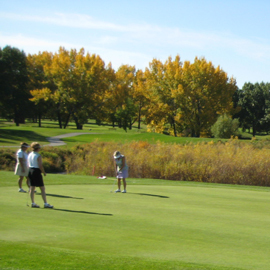 Membership in the Golf Canada and Alberta Golf organizations. Intermediate membership at The Winston is an annual membership available to young adults between 19 and 29 years of age (prior to 2016, the maximum age was 26). Individuals interested in joining The Winston as an Intermediate do not have to be descendants of The Winston members. This membership category is limited, so applications may be subject to a wait list. The cost of the 2019 Intermediate membership shall be $2,180 +GST which includes $200 that will be retained by the club in your name and accrued annually to be applied to the purchase of a transferable share at a future date. The member will forfeit the accrued fees in the event they leave the club before share purchase. Payment (in full) must accompany application. The intermediate application form may be downloaded here. Annual Junior membership at The Winston is open each year to young golfers between the ages of 9 and 18. The club's Junior Program is geared around fun and providing an introduction to golf - the game of a lifetime. Not only does it guide Junior players through golf lessons and course etiquette, it offers social activities and physical fitness experiences away from the links too. The junior program is available here . The application for Junior Members is available here. If you have a child that you feel is ready for the junior program prior to 9 years of age, application can be made by contacting the Head Golf Professional at 403-984-1701. The process will involve an interview with our professional staff is mandatory to ensure your child is ready for the program at The Winston Golf Club. Corporate memberships for 2019 are $21,000 plus GST. The full Corporate Membership Brochure can be viewed here. We also offer Corporate Golf Passes, click here for more information.